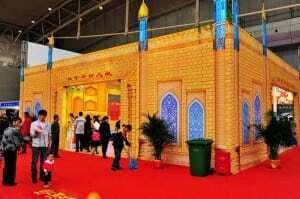 The 2013 China (Qinghai) International Halal Food and Products Fair kicked off in Xining, capital city of western China’s Qinghai Province on April 30. More than 500 domestic enterprises from the country’s 21 provinces and cities, and over 50 overseas enterprises from 17 countries such as Iran, Pakistan, and Sri Lanka participated in the fair. A group of 44 enterprises from Hunan attended the fair and occupied a stand of nearly 500 square meters boasting the highest attendance and largest stand. Its 20-odd kinds of products on display were highly favored, including dark tea, hot sauce, porcelain, and cooked food. The booth of Anhua dark tea was crowded with visitors. Hunan has a great potential in developing the industry of halal food and products, where there are more than 400 halal food enterprises, over 100 halal meat enterprises, and 100 plus halal non-staple food enterprises, said Li Pei, president of the China Council for the Promotion of International Trade Hunan Sub-council. Hunan specialties represented by dark tea, Hunan embroidery and porcelain enjoy great popularity in Muslim regions.